Sure, Ken Block’s Gymkhana videos have all of the stunts and precision driving you could have ever dreamed of being able to do and all of the street closures you wish you had the money to buy, but they’ve never been set entirely on dirt—deep, deep mounds of dirt. Well, welcome to “Terrakhana.” Stay awhile. Boy, does he do different things with it. It marks the return of the not-so-humble Ford Fiesta RX43 we saw in Gymkhana 8, and as recently as Gymkhana Grid last November. “It’s already setup with the Gymkhana style engine,” Ken explains, “600bhp, which is more than I would normally have on dirt. It’s too much power…” Yep, KB remarking that he has too much power. The world has turned upside down. You may have to turn your world—or at least your computer—upside down to follow a couple of these wild moves up and down giant rocks in the desert. 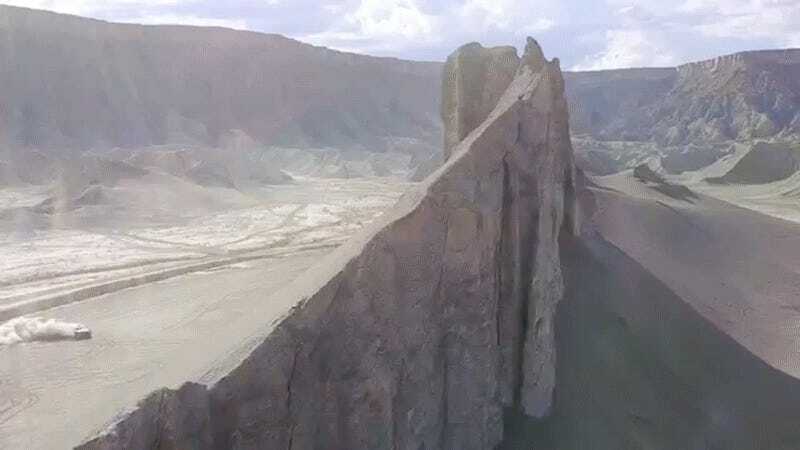 Block told Top Gear’s website that one of the rocks, called the “knife edge,” would’ve been a 100-foot drop “to [his] death” he’d gone off the wrong side. Oh, yeah, that’s totally fine. It’s cool, even. Doesn’t sound terrifying at all. Terrakhana. This sounds like something we could all get used to.